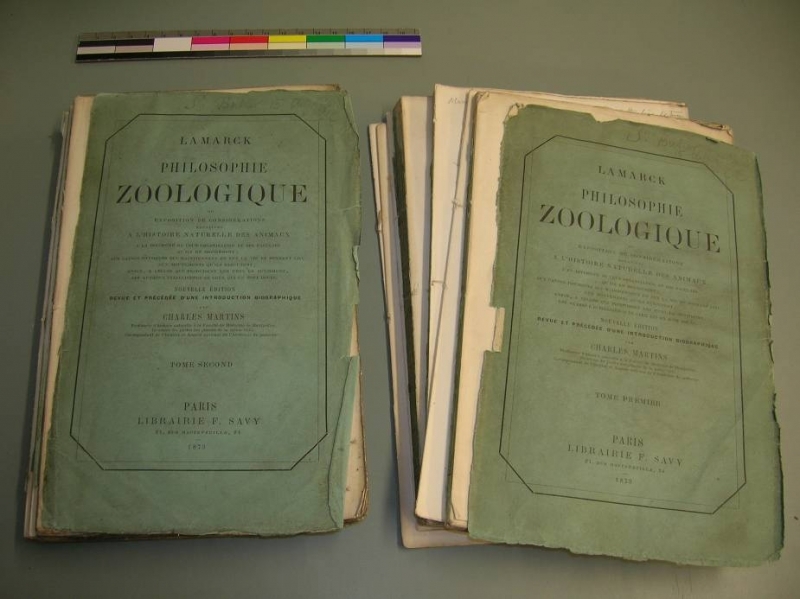 Originally published in 1809, Lamarck’s Philosophie Zoologique contains the earliest account of a cohesive theory of the evolutionary process, putting forward the idea of the inheritance of acquired characteristics (that offspring inherit characteristics which their parents acquired through habitual use, resulting in a species’ gradual adaptation). In the 1870s, having read the Origin of Species (twice) and little else on the subject, Butler wrote his first book on evolution, entitled Life and Habit. Favouring the notion of wilful adaptation over the apparent arbitrariness of natural selection, Butler arrived at a ‘Lamarckian’ viewpoint independently – only discovering Lamarck’s work when a friend pointed out the overlap. Contrary to his original intention, Butler was forced to admit that Life and Habit had ‘resolved itself into a downright attack upon [Darwin’s] view of evolution, and a defence of what I conceive to be Lamarck’s’, and spent the rest of his life defending his opposition to Darwin. 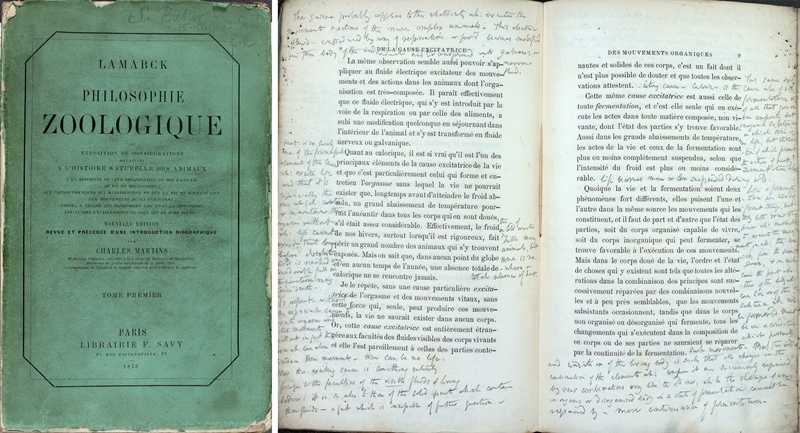 This two-volume set contains numerous annotations and translations made by Butler as he proceeded through the French text seeking a scientific precedent for his own ideas about how evolution worked. It is potentially a valuable resource for scholars interested in the history of evolutionary thought, showing how one nineteenth-century theorist engaged with earlier ideas in an attempt to promote the public understanding of science. Prior to the commencement of the Butler Project, both volumes were in a very poor condition. The original thin paper covers, designed to be economical and temporary, had begun to disintegrate, and the sewing holding the blocks of pages together had almost completely broken down. Joanna Kay, book conservator at the Cambridge Colleges’ Conservation Consortium, took the volumes apart and used a special dry-cleaning method to remove surface dirt from the paper. 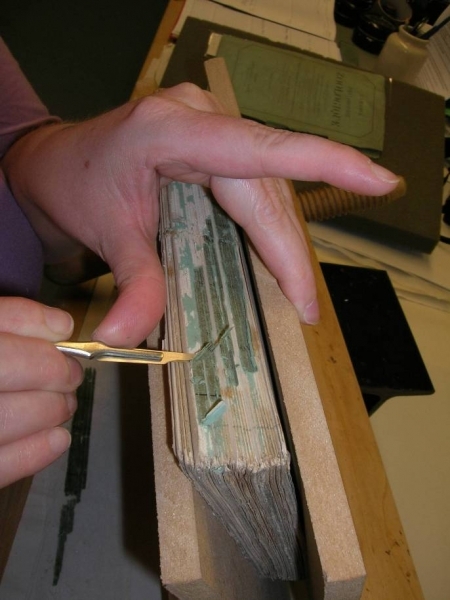 Jo carefully lifted off the remaining spine fragments and painstakingly reassembled them on Japanese paper. She also used Japanese paper adhered with wheat starch paste to repair and support the fragile edges of the original covers. 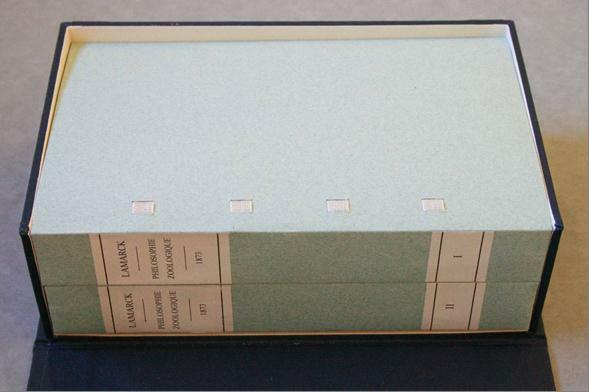 Once repaired the volumes were re-sewn, given new spine-linings, and laced into new paper wrappers. A made-to-measure box was then constructed from archival-grade materials, ensuring the volumes could be stored and accessed without incurring further damage over time.